Battleaxe is a heavy metal band from Sunderland, England. As one of the notable bands of the New Wave of British Heavy Metal scene, they started out with the name Warrior and morphed into Battleaxe sometime in early 1980. 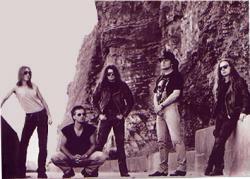 The band consisted of Dave King (vocals), Brian Smith (bass), Steve Hardy (guitar), and Ian Thompson (drums). After playing around the area and honing their chops, they entered the studio to make a demo called "Burn This Town". In doing so, they garnered the attention of Roadrunner Records and the result was their first album, Burn This Town.